"Fun With Speech - Naughty Mosquito"
Minnesota School of the Air was part of the trend in the 1940s and 1950s of using the radio airwaves to educate. This show was in the same genre as NBC University of the Air, Indiana School of the Air, and many other states with the same idea. The radio show was broadcast by KUOM also known as University of Minnesota Public Radio. 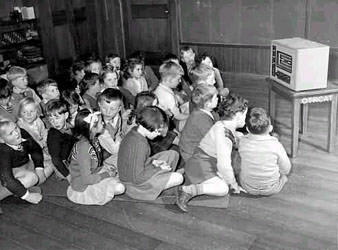 According to the book "The University of Minnesota, 1945-2000" by Stanford E. Lehmberg and Ann M. Pflaum, about 40% of broadcast time was devoted to educational programs for kindergarten through grade 12. Topics for the shows varied from music to speech as well as fairy tales. These charming 15 minutes episodes were broadcast twice a week by 'tape transcription' for in-school listening. Looks What We Found - entertaining recordings on Edgar Allan Poe, trains, lighthouse keepers, forest rangers, patrol men, printers, zoo animals, and much more! See also: Indiana School of the Sky and Your Story Parade (Texas School of the Air). For other great Children's show see also: Let's Pretend, Cinnamon ,Howdy Doody Time, Wormwood Forest, and Children's Collection. Be the first to comment on "Minnesota School of the Air"
MSA Look What We Found - Trains!